I'm off to a seminar with my boss and coworkers this morning (oral cancer detection - important stuff), but there was a recurring question on yesterday's gender reveal party post that I wanted to answer. Yes, we were able to find out Babykin's gender on Tuesday! Thank you for all your prayers. It was a close one. It was an off day to begin with. Baby was moving like crazy around 12:30, but it's usually still asleep at 12:30 - it wakes up and moves around 1:30 on a normal day. So of course by the time I got to the doctor's office, the baby was asleep again. I know he/she moves around in there alot - I can feel it. But I never get to see it! Oh well. The orange juice did not work. Or maybe I just drank it too soon and threw Babykin's schedule off. I don't know. The baby started out bent directly in half - it's feet were up by it's head. Comfortable position, huh? It amazes me how flexible babies can be! Then right about the time when the tech was going to check the gender, Babykin's tucked it's feet together right down there - like he/she was sitting "Indian-style". And they stayed right down there for the rest of the appointment. The tech just kept repeating how it was in the "worst possible position" for a gender check. She also tried jiggling the probe above it's feet to get it to move. I was thinking it was a lost cause - remember how I told you guys that Babykins is shy? If I poke at my stomach, he/she will stop moving. So I didn't have too much hope in the jiggling method. We got the most adorable views of the face - and the mischevious little baby even stuck it's tongue out at us! He/she was taunting us, I think. But, truth be told, I thought it was adorable. Derek and I were praying that Babykins would move it's feet so the tech could get a look. Finally the tech had finished checking everything else, and tried for the gender check one more time. By this time I was thinking about how I was going to have to find one of those little ultrasound places and pay out-of-pocket for another ultrasound to find out the gender. We needed to know this week - I have thirty people coming over tomorrow to find out the gender, after all! This is where all those prayers come in - at the last second, Babykins moved it's feet enough to take a look. I was so relieved when the tech told us she "got it". She then proceeded to shut everything down, and she wrote the gender down and sealed it in an envelope with the "proof" pictures. After waiting what seemed like forever for the doctor, Derek and I took that envelope and went out to dinner to find out what it was . . .
And yes, you still have to wait until Monday for me to announce it on here! Sorry, friends. The family has a right to know before the blog world, I'm afraid. You have until midnight tonight to vote on what you think it is, though! See the little poll in the sidebar. So far 54% of you think it's a girl, and 45% think it's a boy - the gap is closing . . . The doctor told us the baby was doing great - no malformations or other bad things on the anatomy scan, so we have a healthy baby on our hands! Thank you all for your prayers for a healthy Babykins as well - he/she is measuring in right at one pound. One pound! We are officially out of the ounces, people! No wonder he/she can kick me so hard. Earlier this month, I went on a search for invitations for our gender reveal party. 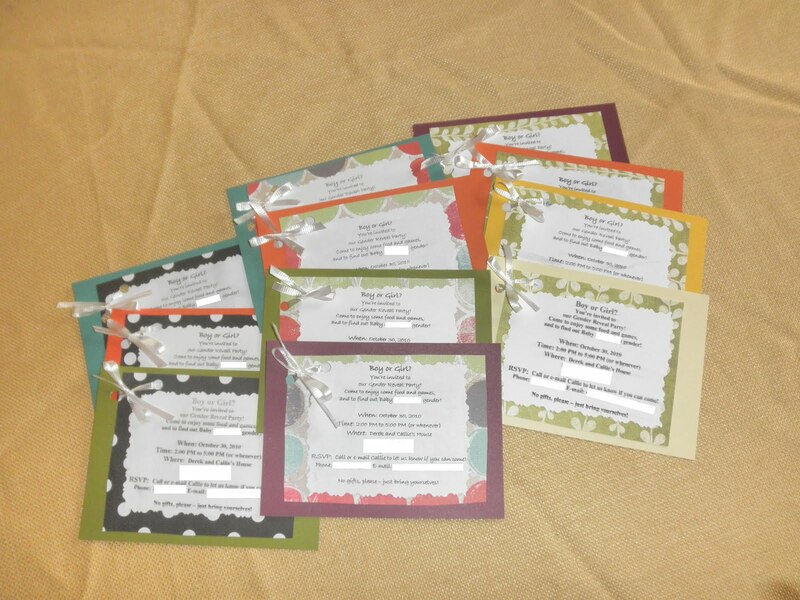 I wanted them to be somewhat gender-neutral, and not too much like baby shower invitations. I checked Walmart, I checked Target, I checked Hobby Lobby. None of these stores quite had what I was looking for. Gender reveal parties are a fairly new trend, so I wasn't expecting to find something that would be perfect right away - but I just couldn't find something that gave the feeling that I wanted. So I did what any girl would do in such a situation - I decided to make my own! I think they turned out pretty cute. Here's what I did. Several months ago I was in search of some blank notecards, and I came across the Gartner Paper Pail at Target. Basically it's just a box full of little cardstock cards and matching envelopes - 200 of them. I've been using it for my thank-you cards, just-because cards, and whatever-else-you-can-think of cards ever since, and it hasn't run out yet. I decided the set would also work nicely for making gender reveal party invitations. I bought some nice patterned scrapbook paper from Hobby Lobby as well, then I went home and got to work. Basically I just used the little notecards and spruced them up a bit. I cut out little squares of the scrapbook paper and glued them together with the notecards (with my handy-dandy glue stick). I printed up the information for the party (I used white cardstock and regular paper - both worked fine), cut them into little squares, and glued them on top of the patterned paper. Then I just punched a couple holes in one corner and tied on a little ribbon bow (I think it made them look finished). You're invited to our Gender Reveal Party! Come to enjoy some food and games, and to find out Baby [Last Name's] gender! RSVP: Call or e-mail Callie to let us know if you can come! Phone: [phone number]. E-mail: [e-mail address]. No gifts, please - just bring yourselves!" I'm quite happy with the way they turned out, and I've gotten a couple compliments on them already! The matching envelopes really made them feel official - and I bought a silver marker for writing the addresses on the darker colored envelopes. They looked pretty spiffy when I dropped them off in the mail, if I do say so myself. The weather has finally turned cold. And when I say cold, I mean bitterly cold. It's as if we went from summer weather to winter weather in the span of one week. The colder weather has definitely put me in the mood for Christmas shopping. I'm trying to be proactive this year and get my shopping done early - you'll remember how I went Christmas shopping in June with my sister. It feels good to get people crossed off the list so early. But as I find my mind turning more in that direction, I find myself in a dilemna. I have no idea what to get the men in my family. It's so easy to find gifts for the ladies - bath stuff, good books, candles, clothes, shoes, accessories. Piece of cake. Men, on the other hand, are not so simple. There are so many things that some men may like and other men may not, so it's not like you can just buy one blanket item and have every man like it. And of course, they never tell you what they would like for Christmas. I've been bugging Derek to make me a list for months now, and I asked my dad the other day what he wanted, and he couldn't give me many ideas off the top of his head either. I know there's got to be something they want. Maybe they just don't recognize it until they see it unwrapped on Christmas morning. Like I said, I'm stuck. Anyone have any good suggestions as I head out in the cold today? Men are so hard to shop for. P.S. 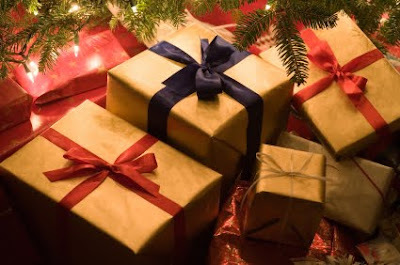 Incidentally, I got the image for this post from GiftIdeaPros.com, - a website dedicated to gift ideas! I may have to research this further . . . Categories: Christmas, Family, Seasons, What Do You Think? I woke up this morning and it felt like Christmas. You know that feeling on Christmas morning - you open your eyes and the first thought that enters your head is "This is a very special day". That's how I felt this morning. We find out Babykins gender today! I'm super-excited; I can hardly contain myself really. Thankfully I need to take a shower and fix my hair before the appointment, and I'm going to take my sweet time with it so I don't go insane with anticipation. Originally, Derek thought it might be cool to keep the gender a surprise until the baby's birthday - but I just couldn't take it. It would be kind of neat to be surprised, but I want to be able to prepare, and set up the nursery all cute, and just know. I also don't do well with gender-neutral stuff, if you remember from the nursery ideas post. Derek understood my feelings and agreed to find out the gender (though I think for a future child we may try the surprise thing for fun). Since Derek was such a good sport about finding out the gender, I told him he could pick how and where we find out. He decided he'd like to have the ultrasound tech seal the answer in an envelope, and then go out to dinner someplace and open it together. So that's the plan - if we can contain ourselves long enough to get to the restaurant. I'll take pictures. I feel so blessed today. Here we weren't even sure if we'd ever have a baby, and now we're about to go to our 22 Week ultrasound. I honestly never pictured us being here this fall, but I'm so grateful. God is good. Though, I must say, I'm terrified that Babykins won't cooperate, and we won't be able to find out the gender today. Wouldn't that be awful? I think I would cry. If that were the case, we'd have to pay out-of-pocket for another ultrasound just to find out the gender - and who knows if we'd be able to do that this week or not! It would sure be a damper on our Gender Reveal Party on Saturday. Can you imagine the confused looks I'd get from everyone if the big reveal moment was "So, we actually don't know the gender . . . but thanks for coming!" Oh boy. If you could all say a prayer that Babykins would be in the perfect position, and they'd be able to tell very easily, I'd greatly appreciate it. And even more importantly, please pray that all the anatomy looks good, and that Babykins is nice and healthy! If you haven't already done so, now would be the perfect opportunity to vote on Babykins gender - see the poll in the sidebar. So far 60% of you think it's a girl. I'm going to leave the poll open through Friday, and then next Monday I'll announce whether we'll be buying baby dolls or Tonka trucks. Keep your eyes peeled! Off to take my really-long-and-drawn-out shower. Two hours and eleven minutes until we leave . . . 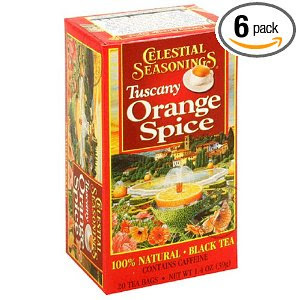 I grew up drinking Celestial Seasonings tea. Oh, but not just Sleepytime and other traditional flavors. We always used to get the special flavors. The flavors they don't sell in just any store. 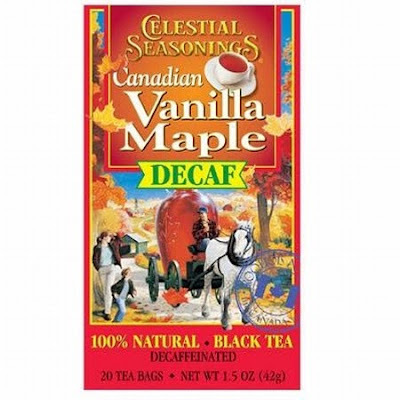 You probably weren't even aware of all the flavors Celestial Seasonings offers, were you? Or offered, I should say. A couple months ago we decided it was time to stock up on some of our favorite teas again. But much to my dismay, I learned something horrifying. Celestial Seasonings has discontinued many of their teas! I couldn't believe it - I would no longer be able to enjoy some of my favorites. Like these dessert teas, which are fabulous with anything sweet. Or the teas I always find myself reaching for whenever I want to drink something hot - like Vanilla Strawberry Rose Ceylon Black Tea, which has the most unique taste . . .
. . . Or Decaf Canadian Vanilla Maple, which is so delicious in the fall, especially when you have a handful of candy corn to go with it. And what about the ones that I never got to try? 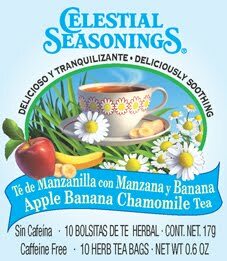 Such as this Apple Banana Chamomile Latin tea, which looks like a fascinating flavor. I promptly called customer service (or rather Derek did - I was rather distraught, and he's good at talking to those people), and we told them how unhappy we were that they were discontinuing so many teas. They said that corporate had decided to discontinue alot of their black teas and white teas, and focus more on their green teas. Now I know that green tea is a trend right now. But every tea company is doing green tea. Celestial Seasonings was different. They had a niche, and they had the most unique tea flavors on the market. Business tip from an unhappy customer - when you have a niche, you shouldn't give it up to become like every other company out there. I was told that if enough people tell them the teas that they really enjoy, they may decide to bring some of them back. I decided to tell them about Vanilla Strawberry Rose and Decaf Canadian Vanilla Maple. One of the teas I called about, Vanilla Strawberry Rose Ceylon Black Tea may be back. At least when I checked again before posting this, it was no longer on the discontinued tea list - so maybe it worked. I don't know. 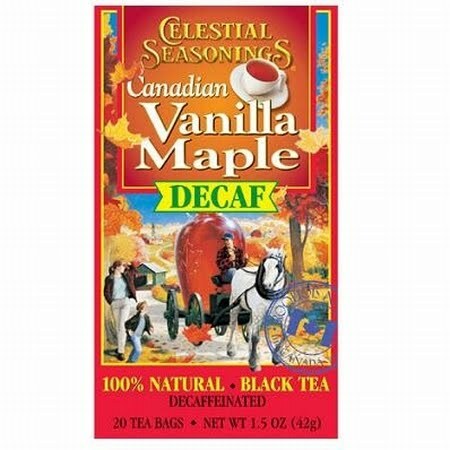 But Decaf Canadian Vanilla Maple is still on the list. I find myself hoarding the few tea bags I have left of my beloved discontinued teas. I suppose I should drink them before they get stale, but I don't want to. Because then they'll be gone. Maybe forever. Oh, Celestial Seasonings, how can you do this to me? Warning: If you're a vegetarian or have any animal-rights-activist leanings, you may not appreciate this post. But it's my blog, and this is my life, and I'm going to talk about it - no nasty comments please, you're not going to change my mind, and I don't expect to change yours. Just so long as we're clear. As you read this, I will be on top of a mountain, searching the landscape for some deer. Those of you who have been following for a while will know that I hunt. My family has always hunted, and I grew up with it. It's in my blood. It's wonderful to just get out into the fresh air and enjoy the Lord's creation, and one way my family does that is by hunting. We hunt because we enjoy it, we love the outdoors and wildlife, and we're conservationists - hunting is a huge part of conservation. Another large reason why we hunt is because we live off the meat all year long. I don't ever buy ground beef or steaks from the store - if we eat a dish that calls for beef, we use elk or deer meat instead. I can't tell you how much money it saves, plus the meat is lean and organic - can't get much healthier, really. Derek and I are really hoping to contribute some meat to the family freezer this year. So, as I lug my sluggish pregnant body up the hill, I'll be shivering in the crisp air, feeling the wind on my face, and enjoying the time with my hubby. And hopefully being successful in my venture. If you're so inclined, pray for a blessed hunt for me, whether I get something or not. Thank you. If I get any good pictures, I'll do a recap post like I did last year. P.S. If you're curious, here are more posts on hunting: Memories With Dad and Fun Time, No Buck. Yes, another pregnancy announcement this week! My goodness, something is in the water. If you read her blog, you'll know that this person is very sweet and genuine, which I had the privilege of finding out first-hand when I met her this past summer. I think alot of you follow this person too, but you very likely might have missed her announcement, because she was so sneaky about it. Very tricky, Girly. I almost missed it myself. So I'm going to give you all a little hint in the form of a link, and you can go over there and congratulate her. I give you full permission to pretend that you are the world's greatest blog follower - you don't have to tell her I sent you over! Here is said person's pregnancy announcement! P.S. Congrats, Chloe! I am so happy for you! P.P.S. Sorry if it feels like I'm bombarding you all with pregnancy congratulations this week - I just really appreciated when people took the time to congratulate me on their blogs, so I want to pass the blessing on. Be assured that you all are going to get pregnancy congrats on the blog when you announce your news too! 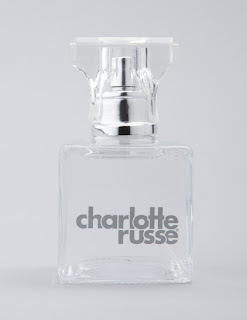 Apparently there are alot of other people who are wondering what happened to the Charlotte Russe Refuge perfume. What makes me think that? Remember that post I did a few months ago about how disappointed I was that they were discontinuing that fragrance? Well, I can't tell you how much traffic I get from that one, single post. It's craziness. I have good news for those of you who are sad that Charlotte Russe stopped producing Refuge! Someone mentioned it to me in the comments all those months ago, and I recently got it confirmed when I made a shopping trip to a Charlotte Russe store recently. They did not stop producing Refuge. They just re-branded it. Now it's simply Charlotte Russe perfume. They just dropped the "Refuge" part - it's the same exact fragrance. Notice the oh-so-subtle difference in the bottle. I know because I sprayed some on while I was in the store. It's the same perfume. Now why do they put us through all that torture of thinking it's disappearing forever when it's not? I have no answer for that question. But to answer the original question, you can buy Charlotte Russe Refuge at the Charlotte Russe store, right at the counter where it always was before. It's just called Charlotte Russe *period* now. I'm afraid you Charlotte Russe Refuge Nights fans may be out of luck though. I have no idea about that one. 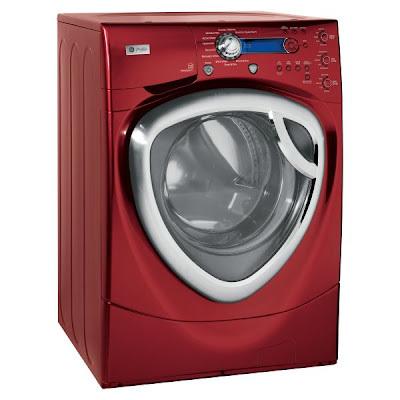 Our washing machine is done-for. 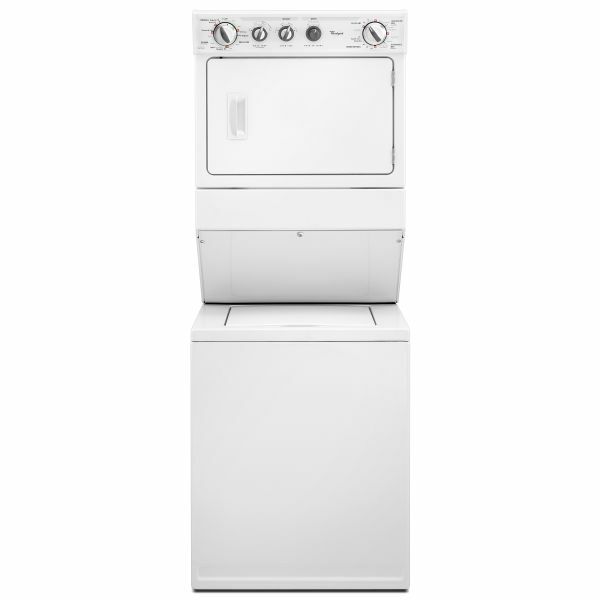 We have one of those stackable deals that my parent's gave to us when they got a new washer/dryer set. As I write it's sitting down there in the laundry room, non-functional, filled with dirty laundry water that won't drain. It's fairly old. I guess I'm just glad it lasted this long. 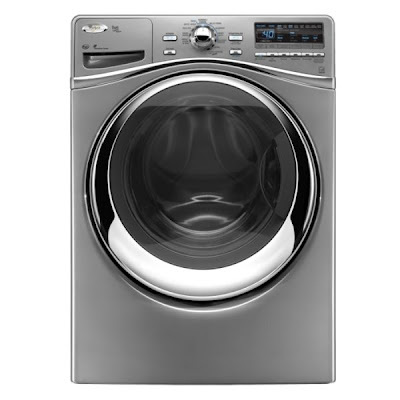 Of course it had to go out right before I could get caught up on laundry, and after we had spent sixty bucks to fix the dryer. And at the precise time when we really have no money to spare. 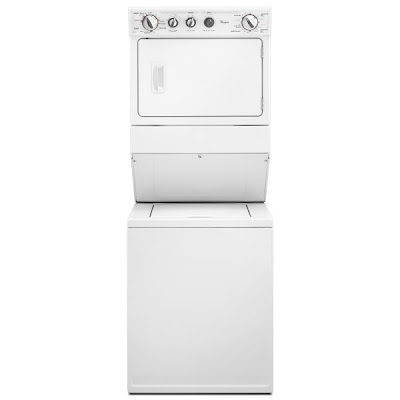 You may be thinking that we could just go to a laundromat for a while. But alas, we have no laundromats anywhere near us. We live in a rural mountain area, remember. Aren't they pretty? But we don't have a very big laundry room, unfortunately. I love the red, but I can't quite justify spending that much extra on something that won't fit and won't be seen. Not exactly how I wanted to spend one thousand dollars, but what can you do? You all are going to think I'm a flake. I changed my mind on the bedroom paint color. 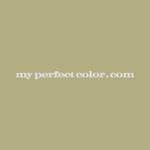 Remember how I decided on that Herbal Garden Behr paint color? After spending the money on the the Herbal Garden paint color, painting the bedroom, and then living with it for a whole month, I finally decided that it's not the right color. I wanted something cheerful and warm, without being too bright. I thought the Herbal Garden color fit that criteria. But unfortunately the color actually ended up looking alot brighter once I had the whole wall painted. It was hard to decide if it was too much though, because it would look so different during certain times of the day. Sometimes it would look nice and mellow, and exactly what I wanted. Then other times of the day, the light would hit it just right, and it would vaguely remind me of a color you might see on a wall in a kindergarten. Yeah, not so good. I finally decided that if I'm going to live with a color, I better like it in all lights. So I found a color that was more subdued and went with that. It's incredibly hard to find the right shade of green for what I'm going for. The color I ended up picking the second time is actually not quite as warm as I was wanting. But it's pretty close, and I'm sticking with it. I finally decided on a color called Sagey from Behr Paint. We bought the paint-and-primer-in-one and I decided to repaint the room this week. It seemed like such a big project at first. I thought my mom might have to come over and help me so I could get it all done. But it was actually surprisingly easy. I painted taped and painted that whole big room all by myself. In one day. About six hours of work, probably. Not too shabby, if I do say so myself! Let me just say that Behr Premium Plus Ultra Paint And Primer In One is pretty much amazing. It covered that too bright green completely with one coat. That's right, I didn't even have to do a second coat! I was quite impressed. I'd definitely recommend spending the extra six bucks to get this stuff if you're ever attempting to paint over another color. It looks kind of gray on my monitor, but it comes across as a nice, subdued green in person. So, what do you think? Did I do good? I'm afraid I don't have a good picture of the room at the moment, but the basement is coming along nicely, and I'll do a video tour when we get the carpet in. It shouldn't be too much longer, and then you can see it in the room itself! Categories: House, What Do You Think? Today I just wanted to reflect on how powerful our God is. I've been continually amazed over the past couple months by how He's been working not only in my life, but in the lives of those around me. As you all know, Derek and I had trouble getting pregnant with this baby. Nothing I've been through has been quite so stressful, or painful. I recently read this on a new blog I found: "I don't know how to explain the feeling of thinking, fearing, that you might not be able to conceive a child as a woman. It's such a sinking feeling. It's easy to obsess over. It makes you feel inadequate." That's exactly right. It can be a dark place to be. I know the Lord accomplished great things in my life through those months of infertility. He taught me to lean on Him, and trust that His plans, whatever they might be, were best. He taught me to look for the ways He was going to use this situation, and I felt assured that there is always a purpose, even when it's hard to see. I wrote several posts on my struggles, and I trust that He has used those posts to encourage others when they needed encouragement. One thing that really helped me through all those months of waiting were my "infertility buddies" as I like to call them. These were ladies that were going through much the same thing that I was, and we would spend time talking or e-mailing, encouraging each other and brainstorming on what to try next. I know the Lord placed them in my life - He knew that I would need them. One of my infertility buddies was Amber. Amber and I went through almost every step of this struggle together. Amber was my very first follower and blogging friend, and we hit it off and ended up e-mailing each other regularly after that. She was the one who told me about the effects of the birth control pill (if you're pro-life, you need to click on the link and read that post), and we went off the pill at about the same time. We both realized we were having problems ovulating, and then we both ended up talking with our hubbies and deciding to try for babies right away. We both prayed for each other. Then, by the Lord's grace, I got pregnant. His grace and goodness, not only in giving us this baby, but in the countless ways He showed me His faithfulness in the months prior to that, still amaze me. Being pregnant only made my burden for my "infertility buddies" heavier. I know so many of you had prayed for me through those frustrating months, and my heart was heavy for my friends who weren't pregnant, but wanted to be. I started praying even harder for those I knew who were still trying, including Amber, who was being told by her doctors that she probably wouldn't be able to get pregnant without fertility treatments. (I hope you know that I still pray regularly for my dear friends who are still waiting for the Lord to grant them a baby - you know who you are). God is bigger than a prognosis. He can do anything He pleases, and He likes to surprise us. Amber is pregnant! No, she didn't do any fertility treatments - in fact she had nearly given up hope of conceiving and had determined that she and her husband may just have to adopt all their children. But the Lord had other plans, and His plans are always the best plans! After I had written this post, I was made aware of another blogging friend with an amazing story of God's grace and plan in this area. You might all remember Jaime? She moved from a Blogger blog to a Wordpress blog earlier this year. She and her husband have walked through infertility for several years, and she became a mother to her sweet little boy, whom they adopted. I couldn't believe it when I read it, but after they had decided it was time to adopt again, Jaime found out she is pregnant! Amazing, what our God can do . . . head on over to Jaime's blog to read her full infertility and pregnancy story and congratulate her too! These are just two stories (three, counting mine) of how the Lord has worked in mighty ways in the lives of ladies I know. There are other stories that I'm not at liberty to share right now. Maybe sometime in the future. I just wanted to encourage you ladies who are still longing for a baby, and wondering if that day will ever come when it's your happy story on your blog. God is more powerful than a diagnosis. He is the Great Physician. He is the Giver of Good Things. Whether He chooses to open your womb, or whether He chooses to reflect His ultimate plan of love and redemption in your life through adoption, He knows what He's doing. He is powerful. And His plans and timing are always perfect. with the princes of their people. I am officially halfway through this pregnancy! Where did the time go? Of course, when I was looking ahead to 20 weeks, it seemed so unattainable, but as I look back at the four months since we found out, it seems like it has flown by! I'm still feeling great! I feel very pregnant right now - my belly leads me. I can't imagine how I'll feel at 8 months when I feel so chubby at 5 months, but I rather like it right now. Over the past couple weeks I got some nice heels that are short enough for my maternity pants (they don't typically make maternity pants long enough for my 3-4 inch heels), and we started planning our gender reveal party. I've been reading that my uterus should be at my belly button this week, but I think we're significantly past that. My doctor told me that my uterus was already at my belly button two weeks ago, and I feel baby movement at or above my belly button periodically. I'll let you know for sure how big it is after our next doctor's appointment. I'd also like to note that my belly button is already partially out! It's been extremely shallow for the last couple weeks, and this past Saturday I was wearing a thin shirt and noticed that I could see my belly button through my shirt. The upper portion of my belly button pokes out when I stand up, though my maternity pants conceal it. So I'm thinking I'll definitely have an outie, and it may be showing up sooner than I thought. As you all know, even though I think I started feeling movement around Week 16, on September 29th I felt the baby for sure, and I started feeling the baby daily after that. On October 7th, I felt the baby kick from the outside! That was pretty exciting. Yep, Babykins is already kicking me hard enough to feel on the outside - I thought I'd have to wait a little longer for that. We were watching TV at the time, and I immediately put Derek's hand on my stomach so he could try to feel it. This is when we discovered that Babykins is rather shy - if I poke at my stomach or apply any pressure, he/she decides to stop moving. It's cute! The baby started back up again after a little while though, and Derek may have felt one of the lighter kicks! On October 14th, Derek most definitely felt the baby kick! He probably felt it on the 7th too, but we know he felt it on this day for sure. On October 16th, I was sitting in bed reading, with my belly bared (don't ask me why - I just like looking at it at night, I guess), and I actually saw the baby move from the outside! I had the book resting on my stomach, and the baby kicked right in front of the edge of the book - I simultaneously felt and saw the movement! It was so cool! 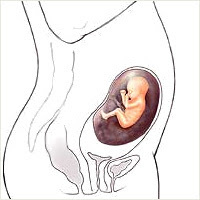 As for the baby, he/she now weighs about ten ounces (which is about the weight of a can of pop or bottle of water), and the baby is ten inches long from head to toe! The baby also has hair now, and it's eyebrows are starting to fill in. My baby tends to like to sit on the left side of my belly, and kick on the right side. I know this because when I lay down my belly sometimes looks uneven and veers off to the left. The lower right section of my belly is it's favorite place to kick - I feel movement there alot! I read that the baby's wake/sleep cycles are similar to a newborn's now - if that's the case, we'll probably be on a wake period every two hours from 7:00 AM to 9:00 PM at first. I should start recording the times when the baby is moving more, and see if a pattern develops. Like I said, right now it seems the baby is more active about every two hours throughout the day. Here are some new belly pictures! I feel like a whale. And I'm only halfway through. So the appearance of the belly depends largely on how I'm standing. I think I'm definitely looking more pregnant now either way though! You can also see me sporting my lovely new haircut in these pictures - I had a brief panicky moment on Saturday, because I wasn't liking the way it looked, but my mom was over and touched up a couple spots, and then I took a shower and styled it. I'm happy with it now! And, of course, the most exciting thing is that we are finding out the gender in a little over a week! We'll have the gender reveal party that Saturday, and then I'll announce the baby's gender on the blog on November 1st. -I had pretty mild morning sickness. I didn't throw up at all, and there were only a couple times when it was actually bad enough to grab the vomit bowl. It lasted from about Week 5 through Week 10. -No cravings. At all. Unless you count Week 6 "cravings", but they only qualified as such in the sense that they were the only thing that didn't make me want to throw up. -Belly seems to be going out front - not to the side so much. And you can see the rest from the belly pictures. -The baby's heartbeat has typically been around 155 bpm. At 9 Weeks (the first time we heard/saw it) it was around 167 bpm. -I haven't noticed any changes in my face, and Derek hasn't gained any weight. Okay, there you go! If you want me to know your guess, you can tell me what it is in the comments in addition to voting. Or if you want to remain anonymous, you can just do the poll, and then once I announce the gender, you'll have the option of pretending that's what you thought all along, even if it wasn't! Just kidding. Aha. The poll is now open. The baby is kicking me this morning. Practicing for future ballet or hockey, I imagine. Funny how something so little can totally make my day before it even begins! Earlier this week my mom offered to treat my sister and I to a haircut. She and my sister just found a stylist that they like, and she wants me to give her a try. To be honest, I'm a little terrified. My mom always cuts my hair herself, because she's the only one who will do a good job on it. I have not had good haircut experiences in the past. I think my hair just puts people in a bad mood or something, because whoever I get to cut it always seems to be grumpy. Then they don't listen to my requests. Then they think they know my hair better than I do and get annoyed when I ask them not to blow dry it. That is, when I can get up the courage to ask - I got a hair stylist once that was in such a bad mood that I was afraid to ask him not to blow dry, in fear that he'd hit me with the curling iron or something. There have been the occasional stylists who did a good job. But they are few and far between. But if my mom says she's good, I'll give her a try. Though I vaguely wonder if my mom is trying to gently give me a nudge to try a stylist other than herself. Which I understand. I guess she can't cut my hair forever. I sigh as I write. I honestly hadn't been thinking about getting a cut for another month or so, because my hair is behaving decently at the moment, but if my mom is treating, I might as well do it now. But if we're going to go somewhere and pay someone (I can't believe we're paying for a haircut), then I don't want to just get a trim. I might as well take the opportunity to try something new. I've never been a chicken with my hair. "It'll grow back" is my motto. So even if this stylist doesn't know how to deal with difficult hair such as mine (I will note here that my mom's and sister's hair are not of the difficult variety), I'm going to go for a bit of a change. If she messes it up, my mom can always salvage it at home. And it'll grow back. I think this one is kind of cute and fun. Or maybe something a bit more punky, like this. I like this one alot, though maybe not quite that short. These two are pretty much what I have going now (except my hair is a bit grown out at the moment), but I like the razor cuts. This one is a bit too round for me, but I like soft edges and playfulness. I'm liking this one, because it seems smooth and sleek, but it would still have the option of being a little punkier if I'm in that kind of mood. In summary, I guess I want to have a short hairstyle, with some layers to make it playful. Of course I do have short, playful layers now, so maybe that's not the best description. Let me try again - I want to go a bit shorter than what I have now, add a bit of shape, and get a bit of punk-rock in there while still being chic and sophisticated. I want a razor cut. All of the above styles have been accomplished with a razor cut. Okay, so what do you guys think? 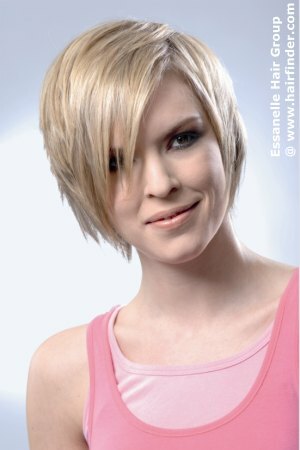 Any votes for which pictures I should take to the hair stylist? I'll post pictures of my new 'do next week! P.S. I can't believe I missed it yesterday, but my other blog friend Rachel announced on her blog yesterday that she and her hubby are expecting their first baby! Rachel is so sweet, and I've really been enjoying reading her blog and getting to know her better. Congratulations, Rachel! The rest of the images from Hairfinder.com. I'm out of blog inspiration for today. Don't you hate it when that happens? 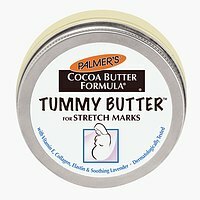 Palmer's Cocoa Butter Formula - Tummy Butter For Stretch Marks. I bought it when I was around 17 weeks, because my poor stomach skin was starting to itch because of all the stretching. I was also afraid I was going to get stretch marks, so I was meaning to buy some anyway. After slathering some on my protruding belly, I'd say this is a definite pregnancy must-have. It really helps with the itchiness and makes the stretching much more comfortable. I'm kind of wishing that I had bought it sooner. It's pretty well-known that cocoa butter helps with stretch marks, and who wants those? And anything that makes the growing process more comfortable gets an "A" in my book! As a sidenote, congrats to Emily, who just announced on her blog that she's pregnant! So happy for you, Friend! It's snowing today. The weather finally cooled down this week, and I'm finally able to enjoy the sweaters and soup that I was missing before. I love snow. Well, I admit that around April I get sick of it, just like everyone else, but earlier in the winter, I just love it. It makes me want to bake, sew, knit, or do some other homey thing, light all the candles in the house (which I already did), and play some Christmas music! Maybe I'll break down and create a Christmas Pandora station today, even though I usually have a strict no-Christmas-music-before-November rule. The snow is just putting me in the mood. My sister and Derek would be so proud of me. You know what else snow puts me in the mood for? Christmas shopping! I don't know why, but I love shopping when it's snowing outside. Maybe I can talk Derek into a dinner/movie/shopping trip later. I finally borrowed my mom's sewing machine this week, and now I'm itching to get some fabric to practice with. This baby has made me want to sew some stuff, even though I never had such a desire before. My sister was the seamstress in our family. I was the baker. I think we've switched roles as of late, because she can make a mean chocolate chip cookie, and now I want to sew. What is the world coming to? I'm going to attempt a baby quilt, but I was thinking that maybe I should make an easier project first, just as a refresher. Maybe a cute little throw pillow, or something like that? I'd imagine it would be pretty easy to make a pillow. I've always been a big fan of color. This is why I was so determined to branch out when it comes to wall colors. I love picking out colors for the blog. And oil painting appeals to me because of all the beautiful colors. So I think I could have alot of fun with a baby quilt. I'll keep you updated as the project develops. And the snow just continues to fall . . . Gender Reveal Parties - Narcissistic Or A Fun Idea? 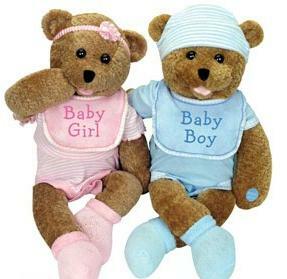 It is the first thing everyone asks you when they find out you're pregnant - do you know if it's a boy or girl? Apparently, the answer is what people want to know, and these days couples have been coming up with more interesting ways to reveal whether they'll be shopping for pink or blue items. Gender reveal parties are a fairly recent trend - basically the parents-to-be keep the gender a secret until the party, then invite people and reveal the gender in some creative way. The gender could be revealed by cutting a cake with blue or pink icing on the inside, opening an envelope with the answer on the inside, opening a bag containing pink or blue balloons, or any other fun thing you can think of. I have read several blogs about different gender reveal parties, and they all looked like such fun, so after we found out we were going to have a baby, I decided that I'd like to do one too. Derek was on board with the idea as well, so that was all the encouragement I needed. We're finding out the gender on October 26th, so we decided to do our party on October 30th, and I realized I needed to start brainstorming for ideas. What better tool for brainstorming than Google, I ask you? So I sat down in front of the laptop and got to work. I'm still working out all the details, but as I was searching the web for ideas, I came across a few different articles against gender reveal parties. I was kind of surprised, but I read the articles to see what the complaints were. One person stated that they thought gender reveal parties were just an excuse to get more gifts. I clearly stated on our invitations that no one was to bring us gifts, so that one I dismissed. There's the baby shower still, and I agree that asking people to bring gifts for the gender reveal party and the baby shower is a bit much. Other sites argued that gender reveal parties are narcissistic and obnoxious. They said it presumptuous to think that people are going to care that much about your baby's gender, and it's rude to ask everyone to give up an entire afternoon/evening to come to your party. I guess in a way I can see their point. Maybe it is narcissistic to hold an entire party just to tell the gender of your baby. And maybe people really don't want to have to come to another party for you, and you shouldn't expect them to. Derek and I hardly ever have barbecues or parties at our house, even though we'd like to have people over more often. But it seems weird to throw a party for no reason, other than the fact that we just wanted to have a get together. So when the gender reveal party idea presented itself, I jumped on it, because it was a good excuse to have my close family and friends over for some good food, games, and other party stuff. Plus from everything else I read, it just looked like alot of fun. Personally, I love going to these kind of things, and I wish I knew more people getting married or graduating or having babies so that I could be invited to more parties. Maybe other people don't like going to these events as much as I do, but the thought never crossed my mind. I don't think motivations for throwing a gender reveal party would always qualify as narcissistic. In my case, I'm not really expecting people to care about the gender as much as I do - to me, it was just a good excuse to have a party. I don't want anyone to bring me gifts. And I only invited my close family and friends who I thought would really like to come (my apologies if any of you really don't want to come, and please don't feel obligated to make an appearance). What do you think? Do think the gender reveal party trend is narcissistic or obnoxious, or do you think it's just a fun idea? Would you throw a gender reveal party? I'm curious to know what you all think. Categories: Babies, Fun Stuff, Pregnancy, What Do You Think? As I was sitting around last night, trying to come up with a blog post for today, the thought popped into my head that my name is one of those names that can be easy to mispronounce. I have had experience with mispronouncing names. Mostly I do pretty well, but then there is the sad case of Felicia. Felicia. My lovely friend and long-time pen pal. We've known each other since we were twelve, maybe? And we've never met in person, or spoken with each other on the phone, but she's the sweetest girl, and a dear friend to me. For all those years I always pronounced her name Fel-EE-Sha, in my head. I just thought that was how to say it. Until a couple years ago when Felicia answered one of those survey things on Facebook, and I discovered that it was not, indeed, the proper way to pronounce her name. Her name should be pronounced Fel-EE-SEE-Uh. I'm afraid I still pronounce her name Fel-EE-Sha in my head. I'm sorry, Friend. Old habits die hard. So, lest any of you should suffer the same fate-slash-embarrassment, I'm going to clarify something right now. My name (which is Callie, in case you didn't know) is pronounced Cal-Lee. Short "a", as in "Cat". "Lee", as in Sarah Lee. Now, don't you feel like you know me better now that you can be certain of my name pronunciation? My Friend, please, please forgive me if we ever meet and I say Fel-EE-Sha. I assure you, I will be mortified to say it aloud, even though I'm afraid you'll always be Fel-EE-Sha in my thoughts. If any of you have unusual names, or unusual pronunciations of your names, now would be the time to clarify. Rachel tagged me in this question/answer post! Basically I have to answer seven questions, then tag seven people to answer seven new questions of my own. Then is I tag you you have to answer my questions, then tag seven people and ask seven new questions . . . you get the idea. 1) What is your favorite part of your day? Hmm, that's a hard one. It depends greatly on the day, but I'd say I really enjoy cooking a good dinner and then having Derek walk through the door with good scents coming from the kitchen. Obviously that doesn't happen every day, but those are some of the times when I feel the most content. 2) What is your favorite meal? Oh, definitely my mom's lasagna, with Ceasar salad and garlic bread. Mmm! 3) What is your morning routine? Let's see, wake up, brush my teeth, wash my face, put in my contacts, fix my hair and makeup. Let the dogs out, make the bed, get dressed, eat breakfast, blog for a little bit. Those are on the days that I stay home. Work days I leave at 5:30 in the morning, so I wake up, do all my bathroom routine, pack a lunch, make breakfast to go, then head out the door. I used to also do my quiet time/devotions in the morning, but lately I've been doing that at night instead, just because it seems to work better right now. 4) If you could go anywhere on a vacation, where would you go? Italy! Derek and I have been wanting to go to Italy for a while - we were going to try for this year, but we just couldn't save enough. So we did the cruise instead, which was lovely, and now we're going to save for 5-10 years for our dream Italy vacation. Probably an anniversary trip/second honeymoon kind of thing. We'd want to see Rome, Venice, and the Tuscany wine country for sure. 5) If you could do any home improvement to your house without money being a problem, what would you do? Well, let's see, we're already finishing the basement or I might have said that. I tend to dream big, so I'd have to say we'd add on to our house. We'd add a garage, with a master bedroom above the garage. My parent's did that to their house, and I think our's has the same potential. 6) Where do you see yourself in 10 years? Hopefully a stay-at-home mom to three or four sweet children! I hope to be homeschooling my kids. We may or may not be in the same house, just depending on whether we decide we want to/can afford to upgrade at that point. But we really wouldn't need to, because we could make our house work with four kiddies, I think. I hope our mortgage is paid down significantly, and we are still debt-free except for the mortgage. Derek will be in a job that he loves. Our marriage will be even stronger, and Derek and I will still be learning about each other and growing closer together every day. I hope to be in good physical shape still, and of course I'll be blogging! That's my 10 year ideal. 7) Do you have a hobby? I suppose my main hobby would be blogging, but I also love reading a good book, and I like to knit in the fall and winter! 8) Why did you start blogging? I started blogging as a way to keep a record of the things the Lord has taught me. That eventually morphed into also including records of our life together, and other posts on my opinions, likes, etc. Sometimes I feel like I have strayed from my original intent on my blog, but I still love blogging about what the Lord is doing in my life. However, the Lord uses circumstances to teach us things and help us grow over time, so the rest has acted as a filler between those teaching times. I don't always blog about everything the Lord has done for me, because some things are so personal or hard to explain, but it's a constant effort for me to try to stay focused on honoring the Lord through my blog and keeping my eyes peeled for those things that I can share. Like I said, it's something I'm still working on! Just because I've either never tagged you, or haven't in a long time! And here are my new questions to you! 1. 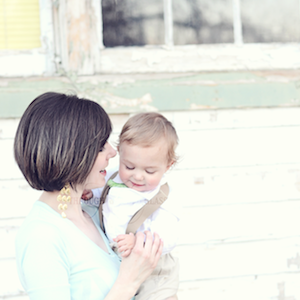 What do you like best about your current profession (stay-at-home mom or student both count as professions to me)? 2. What is your favorite color and why? 3. How did you come to know the Lord? 4. What was your favorite family tradition growing up? 5. What is your favorite girl movie (always looking for a good chick flick!)? 6. What is one book that you would say is a "must-read"? 7. What is one thing that you would like to do for or with your future children? I feel like it wasn't that long ago that I did my last pregnancy update, but I guess it's time for another one already! The most exciting development is the movement that I've been feeling. I've been feeling baby movements like this sporadically since Week 16, but it was a little hard to tell if they were actually the baby or indigestion, so I wasn't always sure. However, since last Wednesday (September 29th, 2010), the feelings have gotten stronger and more distinct. Derek and I were sitting on the couch together, and I felt a little tickling on the inside of my stomach, like several little bubbles popping, and I just knew it was the baby. And every day since then I've been feeling the same movements multiple times during the day. It's so exciting and reassuring to feel those movements! Earlier in the second trimester it's easy to worry too much (though I think I did a pretty good job of not getting anxious), because you aren't having the same pregnancy symptoms anymore, and you aren't feeling anything yet. It hardly even feels like you're pregnant. But now that I'm feeling the baby move, it's so settling - I know he/she is okay, because I can feel him/her kicking around in there! I think it was so thoughtful of the Lord to think to give us the ability to feel our little ones before they are born. He knew we could use that reassurance, I think. I think He also did it to show us what a miracle it is to carry a baby, to remind us that there is a little human being inside of us, and to help us bond with our children even before birth. Our God is so amazing - He thinks of everything! Babykins is about 7 ounces now (whew, almost half a pound! ), and head to rump length is about 6 inches! Add in the legs and it would be even longer, and Babykins tends to measure big, so I wouldn't be surprised if he/she is bigger than that. Fingerprints are developing this week, which I thought was pretty fascinating. I've been feeling great! Occasional heartburn, but that's subsiding a bit, and generally not as tired as I was before (of course my schedule isn't nearly as packed as last month, which is helping). I wouldn't even feel like I was pregnant except for the growing belly and the baby kicking! I had a doctor's appointment last week, and my doctor checked the size of my uterus. As she pressed on the outside of my belly, she said "No wonder you're in these maternity jeans now!" Then she told me that my uterus is clear up to my belly button already! Whoa! That was nice to hear, because I couldn't tell where it was anymore, and I was afraid it might not be growing like it should be. That would also explain why I feel so much fatter in the last couple weeks. Someone most definitely recognized me as pregnant this week. I was standing in Hobby Lobby, looking at invitations for an upcoming event we're hosting, and a lady came up and asked me if I knew where to find "It's A Boy!" stickers, because "I figured you might be looking for something like that too." It made me feel good that I looked pregnant enough for someone to really mention something, but I still think it's rather iffy. It definitely depends on what I'm wearing, the way I'm standing, and the angle that you're looking at me. But I'll let you see for yourself. I must say, I'm puzzled though. My belly can look quite preggo all week, but without fail the day that I decide to take belly pictures, I look the skinniest I have in days. Don't ask me why. Even though it's a skinny day though, I still think I look rather round! I think if you know me, I definitely look pregnant. If you don't know me, I may just look like I have a few extra pounds on me, or I may look pregnant. It just depends on the day, angle, and clothes. See? I've definitely gotten rounder. Don't worry though, I've only gained about 5 pounds, which isn't too shabby considering I'm almost halfway there, and my total will be around 25 pounds. In less than three weeks, we get to find out Babykin's gender! More on that to come . . .
Garnier Moisture Rescue - Love!